Bae Yong Joon in China ! Recently, there is a Korean actor who has been headlining news and every move he makes seems to touch the countless fans’ hearts; he is none other than the one with the supernatural powers – Kim Soo Hyun. After Kim Soo Hyun’s popularity exploded in Asia, the agency that had signed on this ‘charismatic god’ also rose to fame. The boss of this agency, who is Kim Soo Hyun’s strong influence and driving force, is the man who had once captivated many middle-aged women, Bae Yong Joon. One latest news from the production team of JiangSu TV’s program, Take You to the Stars, is a heavyweight one. It shared that Kim Soo Hyun’s boss, the representative icon of the first Hallyu wave, Bae Yong Joon, will also be appearing in the program. Sources revealed that the program will be airing nation-wide for the first time on 25th April at 22:00. In an almost historically significant move, the program’s production team successfully made three of Bae Yong Joon’s FIRSTS happen. One, it will be his first time appearing in a Chinese TV program. Two, it will be his first time being interviewed as a boss. Three, it will be his first ‘stage appearance with his protégé Kim Soo Hyun. As the iconic celebrity in the first Hallyu wave, Bae Yong Joon has long enjoyed a relatively high status in the Korean entertainment circuit. That’s not just because of the incredibly impressive viewership from his dramas, but even more so because of the BYJ-economics that was attributed to him and the effects and influence he had. But what had brought Bae Yong Joon widespread fame and popularity was the drama Winter Sonata that aired back in 2002. This drama had captured the eyeballs of the Korean and Japanese markets and even re-ran for an unprecedented four times. Bae Yong Joon has also been crowned the Smiling Prince because of this drama. The super-high viewership of Winter Sonata had a huge impact on the Korean economy. Unconfirmed statistics cited that many fans visited the shooting sites of Winter Sonata in Korea after watching the drama. In just some six months of 2004 alone, the number of Japanese visitors to Korea increased by 15%, and its direct economic impact exceeded US$2.3 billion. This phenomenon was even dubbed as the Economics of BYJ during that time, and his status skyrocketed to peak at the top in the Korean TV industry. Just then, Bae Yong Joon chose to take a step back from the limelight to switch from being a ‘god’ in the eyes of the female fans to become a ‘god of fortune’. Not only did Bae Yong Joon set up his own entertainment agency, he also put together resources and investments from different sources to carve what is now the KEYEAST. After setting up the agency, Bae Yong Joon successfully signed on some 30 artists in a short span of five years. His sharp eye for talent saw the recruitment of Kim Soo Hyun, Kim Hyun Joong and Lee Hyun Woo; other artists included Im Soo Jung who co-starred with So Ji Sub in Sorry, I Love You, and Choi Kang Hee who had headlined Whispering Corridors, Joo Ji Hoon who had caused many young girls to tear over his portrayal of Prince Lee Shin in Princess’ Hours, and many others. The transformation from an actor to a boss did not stumble Bae Yong Joon. Instead, it had brought him many opportunities. Since his debut 20 years ago, Bae Yong Joon has emerged from an outstanding actor to a force to reckon with in the commercial world, his company has also diversified from artist management to drama production; such multi-pronged developments led the industry to recognize Bae Yong Joon as a powerful player. Since establishing KEYEAST, Bae Yong Joon has slowly distanced himself from the public’s eyes, and he turned his attention to developing new and young talents. The likes of Kim Soo Hyun, Kim Hyun Joong and others are all his ‘discovery’. This time around, for the first time, he will be appearing together with Kim Soo Hyun in the JiangSu TV, Take You to the Stars; this also demonstrated Bae Yong Joon’s acknowledgement of China as an important market. Kim Soo Hyun’s popularity in China soared to a near feverish pitch with the drama You From the Stars, and love calls from CFs and appearances in variety shows keep coming non-stop. As Kim Soo Hyun’s boss, Bae Yong Joon had watched clips from the JiangSu TV Strongest Brain and thought the nature of the program to be suitable for Kim Soo Hyun, and that was the final nod towards Kim Soo Hyun’s maiden appearance in China (in Strongest Brain). This time, JiangSu TV extended yet another invitation for Kim Soo Hyun to appear in Take You to the Stars. Based on the positive foundation of the collaboration for Strongest Brain, Bae Yong Joon had heartily agreed to let Kim Soo Hyun accept the interview invitation. But when the production team expressed their desire to also invite Bae Yong Joon for an interview, he himself had hesitated. 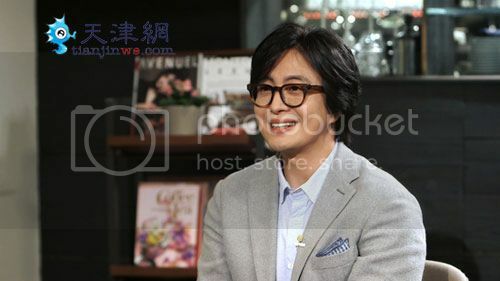 According to KEYEAST staff, Bae Yong Joon had not appeared on any TV program for almost five years, and he is said to be no longer interested in participating in the recording of any TV programs. He actually much prefers the more obscured lifestyle behind the scene. But at the repeated invitations from the production team, the boss eventually agreed. It is understood that this would be the first time the boss and his protégé Kim Soo Hyun jointly appear, so it is a very rare and hard-to-come-by opportunity. With regard to being able to invite Bae Yong Joon to appear in the show, the production team of Take You to the Stars too expressed their immense honor. “Firstly, Mr Bae Yong Joon is a very outstanding actor in the Korean entertainment scene, the BYJ Syndrome he had single-handedly created is still unsurpassed up till now. Secondly, as the boss of the entertainment agency that has discovered and groomed some of the top talents in Korea like Kim Soo Hyun and Kim Hyun Joong, his acute judgement and strong business ability are also evident for everyone to see. His transformation of the two identities of actor and boss is so successful that it is something worth emulating. These are the very reasons why we had hoped to invite Mr Bae Yong Joon’s appearance,” Mr Liu from JiangSu TV’s Brand Communications Team said. According to staff of the production team, Bae Yong Joon had sought very meticulous clarification and communication about the entire recording process, all the way from timing, selection of venue, positioning of the cameras, lighting, script-writing and others. He seemed determined to want to ensure that he had covered everything prior to the commencement of recording. Hi ! Thanks for coming to my blog. I start this blog so I could have a place to meet and communicate with my family, my Baefamily, my friends and my future friends. I'm a wife and a working mother of two children.My work touches Language Teaching and the field of Medicine, my interest is reading, but I also take photographs and do artworks...If I have time for it. Welcome !